We did it. This week, we closed DC General once and for all. Four years ago, we made a bold promise to close the DC General Family Shelter for good. We said what everyone knows to be true: In a city as prosperous as ours, we can do better. DC General was too big, too old and rundown, and too remote to help our most vulnerable families. This week, I thank our landlord partners who have helped our families secure permanent housing across all eight wards. I thank the Community Partnership for the Prevention of Homelessness for their tireless efforts to support our residents exiting homelessness. I thank all the men and women at the Department of Human Services, the Interagency Council on Homelessness, and the Department of General Services for their relentless work to drive down homelessness in the District, to close DC General for good, and to build and open the smaller, more dignified programs we know our families need and deserve. Most importantly, thank you to our entire city for taking on this bold vision. Together, we will continue our work to make homelessness rare, brief, and nonrecurring. With 96 percent of Washingtonians insured, DC has one of the lowest uninsured rates in the nation. Now, our goal is to get 100 percent of Washingtonians covered. DCHealthLink.com, the District’s state-based health insurance exchange established under the Affordable Care Act, provides health insurance to more than 16,0000 residents through the individual marketplace and more than 77,000 people through the small business marketplace. 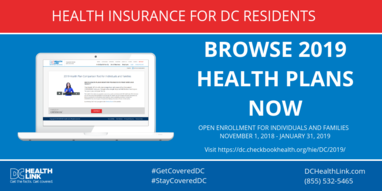 Until January 31, 2019, residents can go to DCHealthLink.com to shop for, compare, and enroll in affordable, high-quality insurance plans. Beginning Monday, November 5, the Department of Public Works (DPW) will begin leaf collection. Collecting leaves reduces potential accidents and injuries caused by slipping on wet leaves and prevents catch basins and storm drains from clogging and causing street flooding during heavy rains. DPW will collect leaves at least twice from each residential neighborhood by “vacuuming” loose leaves residents rake into their treebox. The leaves will then be sent for composting. Find the leaf collection schedule for your neighborhood HERE. Wondering what to do with your pumpkin now that Halloween is over? 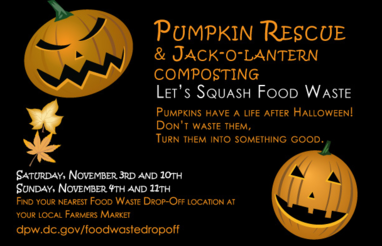 This weekend, the Food Waste Drop-Off Program is teaming up with local food charities and organizations to recover leftover pumpkins for food and composting. On Saturday, November 3 and Sunday, November 4, residents can bring their leftover pumpkins and jack-o’-lanterns to farmers markets throughout the District. Together, we can reduce food waste and help create a greener future for our city! Find a participating farmers market HERE. This week’s District Minute features stories about standing with Jewish community in mourning the tragedy at the Tree of Life Synagogue and denouncing anti-Semitism and hate, the release of the Age-Friendly DC 2023 Strategic Plan, and the kickoff of the District's traffic blitz. 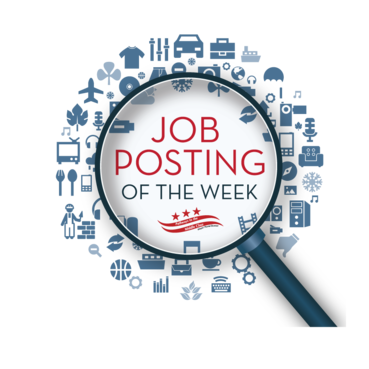 DDOT has an opening for a Sign Painter. This position is responsible for working with the sign shop foreman to plan, create, and install street signs across the District. All details regarding this vacancy, including qualifications, can be found by visiting the job announcement.